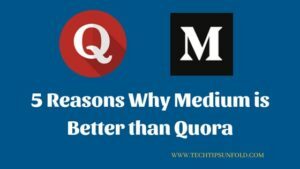 Medium and Quora are two popular blogging platforms of recent times. Both got very informative content and large user base – Both publishers and readers. I personally on Quora platform from the last 5 years and feels like nothing is going to beat Quora when it comes to precise and informative content. But over the years, when I introduced to the other platform, Medium, I started spending much time on Medium than Quora. Now I don’t need to think to answer – Which is the best platform – Quora or Medium? Before jumping into the comparison let’s go through some of the interesting facts about both the platforms. Following are my perceptions about Medium and Quora, and What are the reason I think Medium is given higher preference than Quora. The obvious factor which affects ones perception is UX/UI and overall design of website and App. Do you continue to any website or app if it has a clumsy design? No right. The first thing which attracts or retains the user is UX and its simpleness to use. I do read a lot on Quora website and on App while travelling. It has a very attractive design with red and while colour combination. But believe me Medium is insanely smooth and classic. Any one who scrolls through their articles can feel that. So in this section Medium is having very slight advantage over Quora. In recent days I heard people saying, Quora is becoming next Facebook. Yes, that’s true. These days when I scroll through my Quora feed, I’m getting trash content than the informative articles. Quora is filling up with lot of fake people and fake life experiences. On the other hand, on Medium you will get good information and technology updates. You will mostly find authoritative people with good knowledge base on Medium. We can get good response if we write on technical topics. So if you are looking for tech related articles, Medium is for you. Advertisements are annoying wherever they may be. There exists days when we’ve gone through plain Quora articles with only content. But these days, I’m not able to distinguish whether they are displaying Ad or article. Even for the Ads Quora included Upvote and share buttons. On medium platform, you won’t see any ads. Its as similar as a book of all information. Medium is not monetised with Advertisements yet, but we hope that won’t happen anytime in near future. Quora posts used to be extremely helpful 3-4 years back. But now, as stated earlier it filled with many fake people and its quality is degrading over the years. You need to do some little workaround to find good publications on Medium. But once you follow them you will get good recommendations and great articles. You won’t get unwanted articles on your feed as you get on Quora. Most of the articles on Medium are of 1000-2000 words with in detailed explanations. On Quora only few people get good exposure and get ‘Popular Quoran‘ tag. It is very difficult to get that badge if you are writing anything technical. On the other hand, you will be popular if you share your life experiences. Medium is the platform for technical information (mostly). So if you are a geek, then chances of getting popular on Medium is higher than Quora. Along with these, Medium also has features like – Read time of a story and Podcasts. You will find ethnic story telling content on Medium. So let’s get started with Medium like a pro. Cheers! Yeah.. My preferred one too until I get to know about Medium.